That's great to know he will be willing to ship. The price doesn't concern, but it's the job, and reliability that I was concerned at first. Let me know how it turns out because I'm interested, and I wouldn't let just anyone touch my car unless I know them specifically or the job they have done. S2k projector may modify it to a bi-xeon S2k and the other one will some bi-xeon( undecided ) LED DRL and a mini retro for the fog light since I have an 06 so end result should be 6 hid projectors and some kind of LED DRL that may resemble the 2009 Audi styling. Cool that would look awesome. I think the LED styling for the DRL is a nice addition to the vehicle if that's able to be done that's wonderful. If it's not too much to ask, but can you post pics once you got it done. I would love to see the final product. Just bought a 07 CPO RX400H 40K white, loaded, DVD not sure if I have ML. Can you have Bluetooth without ML? The 400H will help lower the monthly gas bill between the two autos. Welcome to the Club, I'm sure you'll enjoy the 400h! Just bought a 08 Rx400h. Dealer gave me a great deal, approx. 10k off msrp, fully loaded other then m levinson audio. Had dealer install tvs in the headrest for my son which I would highly recommend if you have kids. Last edited by detulliof; 05-31-09 at 12:20 AM. Congrats, yeah you can have bluetooth without ML. If you look on the radio there should be a ML logo somewhere. I have no clue where exactly since we dont have it but it should be there if you have ML. Congrats, I like the black interior. Congrads on your ride, how much did you pay for the headrest monitors ? 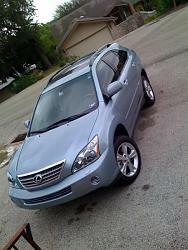 Just bought my first Lexus: 2008 RX400h AWD, in Breakwater Blue with Ivory interior and woodtrim, options include Navi and ML, Premium Plus package, tinted front passenger windows. Love it. 700 miles in 4 days. Pure bliss. This is my second hybrid, drove a Mercury Mariner 4WD Hybrid until a few days ago. Beyond the sheer luxury of the Lexus, the main improvements for me are the bluetooth and the fact that the A/C still works in hybrid mode - that just did not work out for me in TX. On the other hand, I miss my rear sensors (still getting used to the frog-lense reverse camera), the better mpgs (29 to 32 mpg on the Mariner), and the "miles till empty" info - what's the deal with Lexus not offering that on the RX400h - it's been many years since I had a car without that function and I actually now need to pay attention to the gas gauge?!? Hey welcome, congrats on your purchase! Cool picture too! "miles till empty" or Lexus calls is "Fuel Range" I believe. On the RX 350 loaner that i drove last week has the fuel range feature and it gives an approximate miles before I need to refuel notification. Is it silver exterior? And which dealer did you get it from?